Eides in SK for Thangsgiving, a photo by Southworth Sailor on Flickr. It has been a long time since I posted on Southworth Sailor. It just seemed like there was nothing to report. I did preach a couple of weeks at our church's new Sunday evening service geared for the twenties crowd. Thanksgiving brought Greenwood down to Lynden. Bjorn, Jenny and the girls left for Chicago early the next day so as long as they needed to be here, we decided to celebrate it with the Eide family down here. It had been a while since we had a Thanksgiving here. We of course missed Calvin and Bria, but the rest of the family was here. Steph went down to Trout Lake, so we missed her as well. A new addition to the Thanksgiving dinner was oyster stuffing. Only the hearty norsks indulged and I think that they only pretended to enjoy it. It was fun having the house full after the two of us have rattled around in it for a long time. 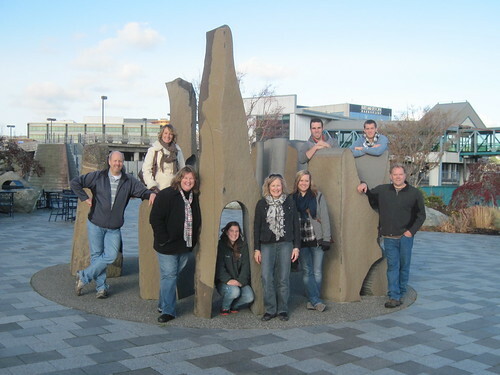 On Friday the weather was great, so we went to Esther's park (Bremerton Harborside) and enjoyed a little sun. Then we drove up to Poulsbo to check out an art school that Bria is interested in. Today I ran fifteen miles in preparation for the Yukon Do It race at the end of the year. I still have not decided whether to do the half or full marathon. We shall see how the next few weeks of training go.